With it’s glorious, semi-operatic score by composer Claude-Michel Schoenberg and lyricists Richard Maltby, Jr. and Alain Boublil (with additional lyrics by the multi-talented Chicago-based Michael Mahler), along with its scorching chronicle of the brutal and divisive war in Vietnam, its feverish mix of politics, romance and culture-clash inspired by Puccini’s “Madame Butterfly,” and its grand-scale visual spectacle (roaring helicopter and all), “Miss Saigon” is a musical to reckon with on every level as it fast approaches its 30th anniversary. Director Laurence Connor and choreographer Bob Avian have heightened the sexuality and brutality in the show, perhaps in keeping with the temper of the current moment, but it can seem gratuitous even in the show’s brothel scenes. And several iconic moments in the storytelling seem rushed and blurry. The ordinarily heartbreaking presence of Tam, the tiny boy who is Kim’s son, and whose existence is unknown to Chris until he returns to Vietnam, also gets lost. Most notably, there is a shift in the nature of the musical’s principal character, The Engineer -- the half-Vietnamese, half-French pimp whose desperate efforts to get a visa that will enable him to flee to the United States is in many ways the driving force in the show. Red Concepcion plays this man in a more vulgar, brutish, drug-snorting and decidedly less charming manner than his predecessors in the role, giving the impression that The Engineer succeeds in nabbing his “American Dream” by force rather than a certain sharply calculated shrewdness. This is a justifiable portrayal, and Concepcion certainly captures the energy and oily opportunism of the man in the same way that the musical suggests the U.S. is more about money than liberty. And his performance is all of a unified piece. But he comes off as more thuggish than wily, and this makes the nature of the survivor less nuanced. The warm-voiced Anthony Festa and endlessly abused Emily Bautista bring heat to the ill-fated lovers: Chris, the American soldier bitterly disillusioned by all that he has experienced in the war, and Kim, the young Vietnamese woman who has suffered every trauma and has ended up working in a bar where drinks are not the only thing for sale. But again, their sexual intimacy is often more vivid than their emotional connection. The show spans the years 1975 to 1978, but the shifts in time and place (including the crucial flashback to the fall of Saigon and the frenzied helicopter departure from the U. S. embassy roof) are somewhat muddy. The re-naming of Saigon (to Ho Chi Minh City), along with The Engineer’s “re-education,” is expertly performed by the company’s acrobatic male dancers just as, earlier in the show, the female ensemble expertly executes every salacious bump-and-grind. As John, Chris’ fellow Marine, J. Daughtry brings a rich voice, if not quite the fierce passion needed to “Bui Doi” (“The Dust of Life”), which exposes the discrimination and poverty facing the biracial children left behind in Vietnam by American soldiers. Jinwoo Jung is Thuy, the resentful, short-tempered soldier who Kim was supposed to marry. Stacie Bono sings strongly as Ellen, the American woman Chris has married after returning from Vietnam. And Christine Bunuan, who has worked at many Chicago theaters throughout her career, is Gigi, the life-hardened bar girl. While the orchestra for the show is first-rate, the uneven balance between orchestra and singers sometimes results in a serious muddling of the all-important lyrics. The one element in this “Miss Saigon” that never disappoints is its visual splendor which has been conceived by Adrian Vaux, with design by Totie Driver and Matt Kinley, lighting by Bruno Poet, projections by Luke Halls and some sort of state-of-the-art engineering and holographic tricks at work in the helicopter scene. 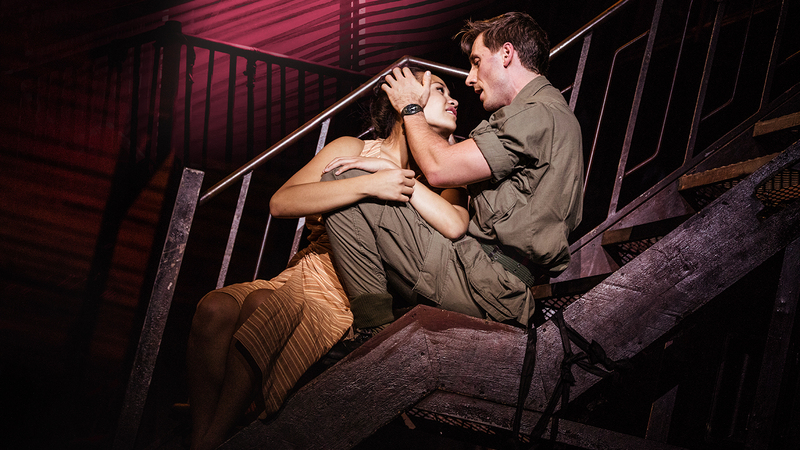 This edition of “Miss Saigon” has its moments. But overall it doesn’t nail those crucial, defining scenes in a way that suggests the full upheaval and tragedy of a war that profoundly scarred many, but is already fading from memory. “Miss Saigon” runs through Dec. 8 at the Cadillac Palace Theatre, 151 W. Randolph. For tickets ($35-$120) call (800) 775-2000 or visit www.broadwayinchicago.com. Running time is 2 hours and 40 minutes with one intermission.